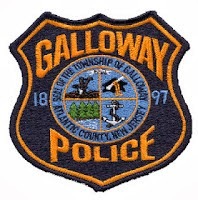 Galloway Township Police responded to 794 calls for service during September 14, 2014 through September 20, 2014. Additional statistics include: 4 Burglaries, 15 Motor Vehicle Accidents, 75 Tickets issued, 3 Driving While Intoxicated, 30 Arrests, 21 Domestic Violence, 14 Fire Calls, 87 EMS Calls and 0 Juvenile calls. On 9/15 Bryan T. Allen 37, of Galloway was arrested by Officer James Mulholland and charged with possession of CDS and drug paraphernalia. On 9/15 Andrew D. Given 50, of Absecon was arrested by Officer Kevin Costa and charged with DWl..
On 9/16 Jessica R Donegan 35, of Galloway was arrested by Detective Ryan Goehringer and charged with possession CDS. On 9/16 Brian Oshea 19, of Absecon was arrested by Detective Ryan Goehringer and charged with possession of CDS and paraphernalia. On 9/16 Gianna M. Hilton 19, of Ventnor was arrested by Officer Christian Magazzu and charged with Unlawful Littering. On 9/16 Christopher Tranchetti 29, of Absecon was arrested by Officer Carolyn Buckley and charged with driving while suspended after 2 DWI's. On 9/16 Marcia A. Amsparger 35, of Galloway was arrested by Sgt Joseph Picardi and charged with Hindering Apprehension. On 9/18 Sherman D. Scott 44, of Pleasantville was arrested by Detective Bryan Casey and charged with Engaging in Prostitution. On 9/18 Sean Temple 28, of Atlantic City was arrested by Detective Bryan Casey and charged with Promoting Prostitution. On 9/18 Nasheemah Alexander 28, of Atlantic City was arrested by Detective Bryan Casey and charged with Engaging in Prostitution. On 9/18 Russell W. Jones II 31, of Egg Harbor Township was arrested by Detective Bryan Casey and charged with Promoting Prostitution. On 9/18 Felicia Pennington 19, of Egg Harbor Township was arrested by Detective Bryan Casey and charged with Engaging in Prostitution. On 9/18 Nicholas Iannelli 21, of Sewell was arrested by K9 Officer Kevin Welsh and charged with Alcohol in Unauthorized Areas. On 9/20 Richard R. Dix 18, of Galloway was arrested by K9 Officer Scott Winneberger and was charged with Possession of 50 grams or less of Marijuana and Drug Paraphernalia.